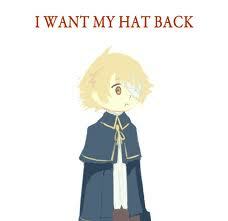 Oliver wants his hat!. . Wallpaper and background images in the Vocaloid Oliver club tagged: vocaloid oliver oliver engloid vocaloid vocaloid3. This Vocaloid Oliver photo might contain surcoat. Aww don't worry Oliver You'll find it!